"Ra Gada. You all know that the elves are outside our walls. These infidels call us barbarians. They would drive us from this land, but what the elves do not know is that Ruptga himself guided us to these shores. He decreed that the Alik'r would be our home. Today the infidels will see the strength of the Shehai. Onsi will guide our blades. Today the sands will run red with elven blood!" The first recorded wave of migration took place around 1E 780, prior to the destruction of Yokuda. After winning a war against Emperor Hira, Frandar Hunding and his army of sword-singers left their homeland and sailed to Hammerfell. Alongside him were renown warriors such as Ra Abah, Razul and his son Divad Hunding. Hunding's flotilla of ships landed in Hammerfell and discovered vast numbers of giant goblin strongholds littering the sands. Frandar refused to co-exist with the Flint-Tooth tribe on their new homeland, and rallied his army to slay the beasts. Frandar was killed in one of the early conflicts, but Divad pushed onward and conquered the Alik'r Desert. The next wave is believed to have occurred around the time of Yokuda's sinking in 1E 792. This wave was comprised of ships that departed from both the continent and its islands, including Yath and Akos Kasaz, the largest island of Yokuda and home to its capital. 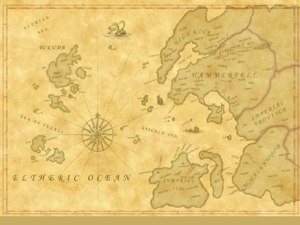 The bulk of the refugees, including the Na-Totambu ruling class, were put ashore on the island of Herne while the Ra Gada sailed on to mainland Tamriel in 1E 808. The fleet first landed at Hegathe on the southwest coast of Hammerfell. 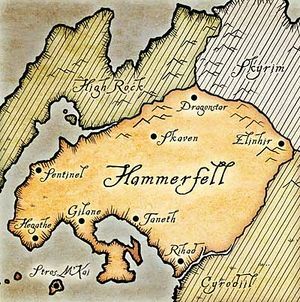 From Hegathe they spread along both southern and western coasts, while others continued north and east into Hammerfell itself. To the southeast went the second wave, also known as the "Tavan wave". The Tavans revered the Yokudan bird-god Tava, and believed she guided them to Herne. As such Tavan arms and armor were replete with bird imagery. Their fleet of fifty-six ships traveled towards Hunding Bay and the southern coast of Hammerfell. The island of Stros M'Kai was one of the first landfalls settled by the Yokudans. They discovered the peninsula of Khefrem's Boot. Led by Prince Hubalajad, he established the city of Abah's Landing and built a citadel named No Shira. Some accounts speak of a Ra Gada sect known as the Glinting Talons. These warriors also revered Tava and were possibly related to the Tavans. They were known to engrave their blades with the wings of a hawk, and employed a fighting style so aggressive that it left their enemies standing stunned. They fought in a conflict known as the Battle of Six Hands, but much of the details are lost to history. To the north went the third wave of warrior-sailors under the leadership of Grandee Yaghoub, in ships they had brought from Akos Kasaz. Yaghoub was the first of the Ra Gada to discover the Iliac Bay as he rounded Cape Shira. Yaghoub, following the constellation of the Steed, decided to make his home on the northern coast of Hammerfell and established the city of Sentinel. Many of the Ra Gada kings were wealthy corsairs, and raided Breton coastal cities and merchant vessels along the southern Iliac Bay. However on one occasion, Peregrine Direnni drove an entire Ra Gada flotilla back to Sentinel by using her prodigious sorcery to manipulate the waves of the Iliac Bay. Ra Gada colonists from the island of Yath clashed with an Altmeri clan known as the Corelanya. They quickly established settlements along the coasts of Cape Shira, and built a grand palace in a valley known as the Ash'abah Pass. They also attacked the Altmeri inhabitants of Salas En, and established their own settlement within the ruins. The Yokudans pushed farther inland into Bangkorai and discovered the ruins of Nilata, which were also inhabited by Elves. The fourth wave of Ra Gada was arguably the most ruthless. Led by the self proclaimed emperor Tarish-Zi, the Anka-Ra wave cut a bloody swath across Hammerfell and all the way into Craglorn in their search for a new home. In their wake, the Nedes as a distinctive people disappeared from the historical record shortly after their arrival, although some accounts claim Nedic culture was already fading prior to the Ra-Gada. They established Hel Ra Citadel, a vast complex believed to be used as a training ground for their Ansei. Once the Ra Gada had established footholds in Hammerfell, the Na-Totambu ruling council and the Yokudan nobility followed and rapidly resumed their traditional rule. In response the renowned warrior Razul, a contemporary of Divad Hunding, made himself Yokeda (or Lord) to cement the power of the Ra Gada. After conquering Hammerfell, the Yokudans found themselves in a time of relative peace. Many Ra Gada put down their swords, in favor of their love of farming and building. Within three generations, many Yokudans forgot the teachings of the Way of the Sword, leaving them vulnerable until the time of Derik Hallin. Under the provincial organization of the Second Empire, Redguard society fractured to form two "parties" to aid Cyrodiil's administration of Hammerfell. The Na-Totambu ruling class retained the rights of noble council, and began calling themselves the "Crowns" to illustrate their history of leadership and nobility. The warriors of the Ra Gada were granted rights of ownership within their tribal districts. This empowerment fundamentally changed the Ra Gada, who began to call themselves the "Forebears", to emphasize the fact that they arrived on Tamriel first. Despite the Forebears' later desire to assimilate, their forefathers were strongly opposed to outsiders during the First Era, and were mostly responsible for preventing the Alessian Doctrines from having a strong presence in Hammerfell. The emblem of the Ra Gada was said to be the water symbol, however no known representation of it exists. The warlords of the Ra Gada were awarded medals when they first arrived on Tamriel's shores, some of which were still in circulation into the mid-Second era. In 3E 397, several Ra Gada artifacts began circulating around the Dragonstar area. Light armor, blunt weapons, longbows and magically protective warpaint were among the documented items. Several items of Ra Gada weaponry also came to light in Cyrodiil in 3E 433, at the time of the Oblivion Crisis.